While delivering an impassioned speech to the more than 700 attendees assembled at the Big Tent for Israel conference in Manchester on Sunday, Israel’s new Ambassador to the UK, Daniel Taub, singled out the Guardian’s Deborah Orr as an especially egregious example of the media assault on Israel’s legitimacy. The Guardian’s disproportionate role in the delegitimization of Israel was also the focus of presentations delivered by several panelists in the two conference sessions which I participated in, including Jonathan Hoffman, Richard Millett, and Michael Weiss (of the Henry Jackson Society). The event was inspired in large measure by a Reut Institute report which highlighted London as the international “Hub of Hubs” of the campaign of Boycotts, Divestment and Sanctions (BDS) whose express purpose is to challenge and undermine the legitimacy and existence of the State of Israel. 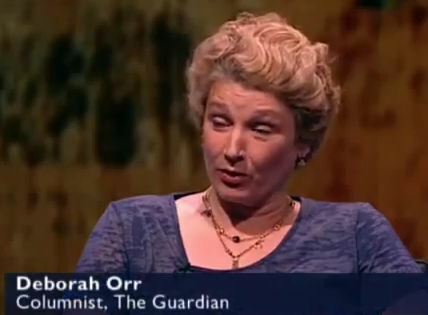 While news of the Guardian’s notoriety in the UK is always welcomed, the fact that Orr’s contemptuous swipe at Zionist Jews continues to be the focus of so much opprobrium is especially heartening given her subsequent non-apology, and unwillingness to engage in anything resembling actual reflection. I wonder if you could give some guidance on how to criticise some actions of the government and/or armed forces of a state that claims to be Jewish without arousing an accusation of anti-semitism. It does sometimes feel like being stuck in a loop. Herb, Balance coverage of Israel with coverage of rocket attacks on Israel by Hamass, genocidal rants by Nasrallah of Hezbullah and the President of the Islamic Republic of Iran. Coverage of Hamass childrens TV programs where Jews are compared to pigs and apes. Cover the Hamass charter which invokes all sorts of racist depictions of Jews. Cover racist rallies by Islamists in the UK, Islamists threatening the UK with attacks. Is the coverage of Syria match the coverage of Israel during its campaign against the rocket attacks by Hamass. Cover Muslim-Only roads and cities in Saudi Arabia. Cover the lack of non-Muslim houses of worship in Saudi Arabia. Expose the lies pushed by “the left” which claim that the people of Gaza are starving to death. Where are pictures, interviews of “starving” Gazans? In the same way as you might criticise the actions rather than the existence of an Islamic state if you didn’t want to offend Muslims. You are already at a disadvantage, it seems from your post, because you appear not to realise that although Israel is a Jewish state it is a secular one (in much the same way as the UK is a secular Christian country), and it does not impose Judaism on any of its citizens. Every religion is allowed to worship freely. Supporters of Israel tend to be sensitive to questions like yours. For a start, Israel IS Jewish, she does not “claim to be” Jewish, but that alone does not define her except in the minds of those who believe that she should not exist. So you need to be very careful about the emphasis you give to the Jewishness of Israel and not to use that as an excuse for criticism in the same way as you would not use the Islamic/Islamist nature of Saudi as an excuse for criticising its policies. (b) regurgitate all variations of the themes about alleged “Jewish power” (lifted variously from the rubbish in ISM and PSC leaflets and swallowed whole and unthinkingly) but substituting “Israeli” for “Jewish”. This is a dead giveaway of the wolf in sheep’s clothing which is the antisemite wearing “antiZionist” clothes. You seem to be an intelligent person. The above is my take on your question, others might disagree and/or could probably add to the points but you are probably aware enough not to be wilfully offensive in the criticisms you make. That total 1-sidedness, and constant criticism of the admittedly not perfect but still by far the best respecter of human rights in a very bad neighborhood, is what’s most telling about the real motivations of those who just want to “criticize the government of Israel”! Good for Daniel Taub. Deborah Orr’s comment was not only offensive, it was patently absurd. I am willing to bet that she doesn’t even believe what she wrote herself, and that her sole purpose was to stir up hatred for Israel. She is obviously a keen student of Goebbels. Even more disturbing however is that the Guardian saw fit to print her obscene dribbling piece. A decent newspaper would have rejected it as blatant hate-speech. It’s horrible prose as well as being absurd, offensive, antisemitic and deceitful. She must have really laboured to get out “abject”. “eagerness” “accept” followed by those flatulent subordinate clauses where the “unfortunate neighbours” round off the whole pile of rotted fish. She is obviously a keen student of Goebbels. Deborah Orr’s comment was indeed both offensive and absurd – but the above is just a stupid thing to say. I am proposing a motion at the Board of Deputies that the Board should lead an embargo of The Guardian by all right-thinking readers and advertisers. The suggestion was well-received in Manchester yeterday. Codswallop. You need to get out more. A BDS of Der Guardian and its advertisers which support Der Racist Guardian. The Guardian is primarily concerned with its own survival. The Jewish population in the UK is very small – the same size as the Guardian’s circulation – so an embargo is not something that will concern the Guardian management. Their business focus is the much much larger arabic speaking market – I guess that is why they they use their internet platform to publish the occasional article written in arabic (rather than, say, Russian or Chinese) to test the water. They are pitching to this market. Take a look at their homepage, and anyone can see that statement is complete nonsense. On today’s CiF webpage right now – 12.57 British time – an article titled ‘Middle East and North Africa’ is published in Arabic. On the frontpage (Latest news, sport and comment), under ‘Record turnout in Egyptian elections’, there is an article published in Arabic. Since the start of the Arab Spring the G. has started adding the very occasional article in Arabic – which seems to be aimed at the people on the street. But you said above “Their business focus is the much much larger arabic speaking market” – which is frankly laughable. Why not just retract your comment? He said they are testing the water. Even though your claim that the Guardian’s “business focus is the much much larger arabic speaking market” is demonstrably wrong? Oh shut up you moron “Pretzelberg”–your biases are making you sound really stupid, and since every single comment you make is antiIsrael ( or its supporters), why bother writing more of your nonsense? Get a grip on your hatreds and yourself, and then get a life. Very sad I missed this conference.